Leif Arrhenius is a professional athlete who competes in track and field throwing events. During high school, he was a three-time state champion in shot put and discus. He was also a three-time region champ in shot put and discus and was ranked first nationally in discus in 2003. In 2004, he ranked second in shot put and third in discus and hammer in the nation. Arrhenius was born on July 15, 1986 in Provo, Utah. His father, Anders is a former professional shot put athlete in Sweden. His brothers, Dan and Nik are also throwing athletes. Leif competed at BYU, as did his brothers and father. His father and brother Nik are former Olympic athletes as well. 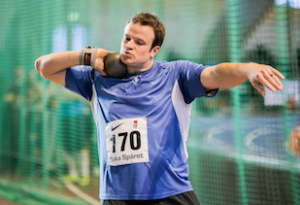 Leif was crowned NCAA indoor champion in the shot put in 2011. During his competitions in World and European Championships, he primarily threw shot put and placed in the top twenty. His personal best was 20.50 in 2013 (outdoor) and 20.29 (indoor). He placed 19th in shot put at the 2015 European Indoor Championships in Prague and 23rd in shot put at the 2016 European Championships in Amsterdam. Arrhenius is a member of The Church of Jesus Christ of Latter-day Saints. He served a full-time mission to Taiwan. This page was last edited on 24 April 2017, at 16:11.